Sciatica is the name given to pain that generally starts in the lower back and extends through the buttock region, down the back of the leg and into the foot. It normally affects one leg only, rarely both. Sciatica is caused when the large sciatic nerve becomes irritated; normally the result of localised pinching in the lower spine. As anyone who’s suffered can vouch, the pain can be excrutiating. The sciatic nerve is the largest in the body and is composed of individual nerve roots that branch out from the spine. The nerve then branches out to the various parts of the leg below. The symptoms, be they leg pain, tingling sensations, pins and needles, numbness or weakness are different depending on whereabouts in the lower lumbar or sacral region the nerve is actually trapped. There are several causes of Sciatica. 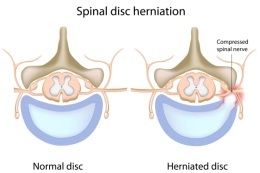 The most common cause we see in our Ashford clinic, is a herniated or prolapsed disc, often referred to as a slipped disc. Each segment of the spine is effectively cushioned by a flexible disc that protects the spine from vertically applied compressive forces (such as those that occur when we jump and land). The disc itself contains a pulpy substance called the “nucleus pulposus”. If the fibrous outer wall of the disc (the annulus fibrosus) ruptures then the inner core can leak out applying pressure to the sciatic nerve that runs adjacent. Unfortunately the disc is not strong against rotational forces and these can cause the disc to rupture. Such forces can occur simply by bending at an awkward angle and lifting something heavy. Osteopathy can be effective in relieving pressure on the trapped nerve and many clients find acupuncture excellent for the pain. We can also advise on specific exercises to develop the core muscles which will help support the load on the spine. I am a sixty something man with deteriorating hips and eroded lumbar spinal discs. These complaints have caused me considerable and continual discomfort in the past, virtually eliminating even the gentlest form of physical activity and interrupting sleep nightly because of sciatic pain. Since seeing Cecile, I now walk my dog between one and two miles daily, I regularly visit a gym and have just signed up for a line dance class!! I experience only occasional “niggles”, and I regard my sessions with Cecile now as more of a “tune up” rather than a necessity for pain relief. I managed to slip my disc just getting my laptop bag out of the back of my car. The pain was excrutiating and went down the back of my left leg as well. Apparently I had trapped my Sciatic nerve. Cecile was able to work the area to reduce the pressure on the nerve which made a huge difference.